Aberdeen Music Hall - AberdeenJimeoin: Result! An Irishman from Australia, Jimeoin has carved a name for himself as one of the true masters of live comedy. 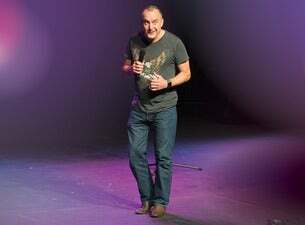 He's bringing his brilliantly observed, ever-evolving and hilarious comedy to the UK as part of his latest smash hit tour Ramble On. Jimeoin is internationally acclaimed and his shows sell out across the UK, Europe, US and of course Australia. Hailed as a genuine “fair dinkum” stand-up alumni, don't miss your chance to see this award-winning star of TV shows including Live at the Apollo, Conan, Royal Variety Performance, CH4’s O2 Gala and Sunday Night at the Palladium live!